Kaylee Brewer earned prestigious Gold Key Honors in Art! Lisa Tedesko guides a Workforce Learning Board meeting. Two weeks ago an emerging Cañon City High School artist named Kaylee Brewer earned the highest honors achievable in this year's Scholastic Art & Writing Awards, a Gold Key! All CCHS artists focused on printmaking during the 2nd quarter in Advanced Placement Studio Art. 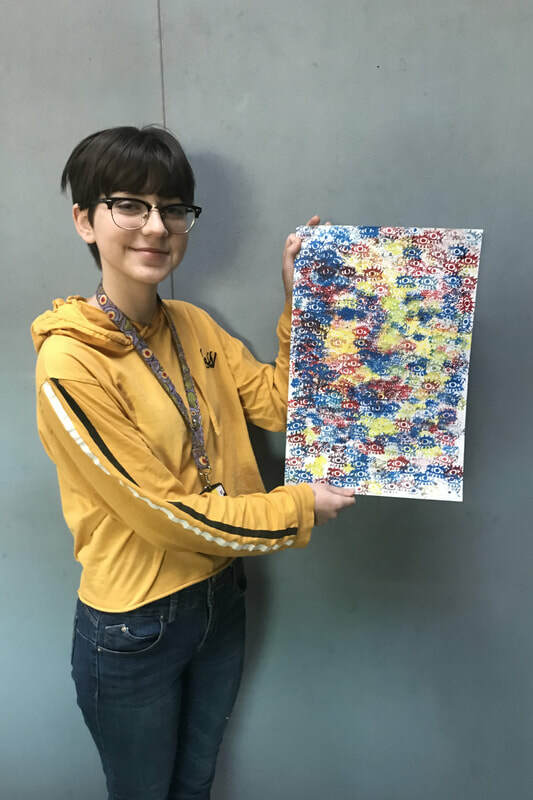 Kaylee's teacher Kristi Cushman says Kaylee took printmaking to a whole new level through experimentation and making multiple pieces, which led to the creation her award-winning print. Kaylee's art will be on display at the History Colorado Center from February 15th through most of March. She will also get to attend a statewide awards ceremony on March 9th. To add to all this excitement, Kaylee will find out on March 15th if this piece is worthy of a national award. Intern and Apprentice Coordinator Lisa Tedesko has been hard at work raising scholarship dollars for this year's program participants, lining up intern opportunties for next year's students, and sharing what she knows about program development with schools from the San Luis Valley. Two weeks ago she hosted five educators from the Saguache area who are interested in starting their very own Internship program, and once again we are reminded that Lisa runs one of the best in the state. Readers can access a larger image of this calendar proposal at the the www.echoesfromcanon.weebly website. I want to thank Director of Human Resources Misty Manchester, Director of Special Services Tim Renn, and New Teacher Support Coach Jamie Davis for recently submitting an Attracting and Retaining teachers grant application. The major focus of their effort is to secure avenues by which we might offer affordable childcare to our teachers who are growing families. We look forward to learning if their effort was successful. Speaking of attracting and retaining high-quality staff, this Wednesday evening we'll hold our first Civic Canopy community engagement session where we'll work with community economic and civic leaders to develop and execute a plan to expand ways the Cañon City School District might more readily attract and retain high-quality educators long into the future. This is the first of three sessions will take place on February 13, March 14, April 25, and May 31. If we are successful we'll expect to see an increase in the number of qualified people who apply for open positions in our school district, be they classified or certified. The beneficiaries of this work, of course, will be our children, our families, and the entire Cañon City Community. Sticking to our major focus of attracting and retaining high-quality staff to work with our children as assigned by the Interest Based Solutions Committee that met last fall, a District Calendar Committee has completed its work and is recommending significant calendar changes. The result is a recommended school year consisting of 161 student contact days with every other Friday being either a two-hour early release day to be used for professional development, or a no school-no work day. This is only seven instructional days shorter than our traditional calendar. However, by increasing each school day fifteen minutes it meets all the requirements set forth by the Colorado Department of Education for student-teacher contact and to maintain what is defined as a 5-day school week calendar. I've attached an image of the recommended calendar to this post. It will be formally presented to the Board of Education as an information item on Monday, February 11th. The community will then have opportunties to offer feedback about it at the Board's February 25th meeting. The board will either adopt it as presented or with recommended changes based on feedback offered, at its March 11th meeting. Instructional Technology Coordinator Dan Coppa leads discussion among K-5 technology instructors. On Friday afternoon CCSD Instructional Technology Coordinator Dan Coppa facilitated a meeting of our K-5 technology teachers and principals in an effort to begin devising a plan for the role of elementary instructional technology staff. Discussion surrounded how our instructional technology staff experts can support regular classroom teachers when their students acquire their Chromebook devices during the 2020-21 school year, and to what extent they should still guide direct instruction. Key to this concept is how we ensure all K-5 teachers continue to receive the daily instructional planning time we have promised when roles change. Director of Operations Jeff Peterson guides design discussion with GE Johnson and RLH Engineering personnel. Board President Larry Oddo participated in the Design Drawing meeting along with Architect Doug Abernathy. Operations, technology, and nutrition leaders double check the locations of specific building spaces. On Wednesday we had our building Design Drawing meeting. At this time we learned the Cañon City Middle School project is coming in pretty much as budgeted, even after we asked for add-alternates to replace the 1925 section roofing and the 1980 gymnasium floor to be part of the regular bid package. This budgeting work includes an increase in our contingency to 3% because of the general nature of remodeling work. We then gave permission for the Design-Build team to engage specific contractors for mechanical, electrical, concrete, and steel provision. This creates an opportunity to begin groundwork on the Cañon City Middle School site before the end of this school year. Due to significant below groundwork needed at the Washington Elementary site as a result of unstable soils conditions, this project has come in $500,000 above original projected base costs. In response, we had to approve the release of that same amount in project reserves to get the construction process underway. Though this is not an ideal situation, we still have over $1 million in owner reserves dedicated to this project, as well as significant construction team reserves. 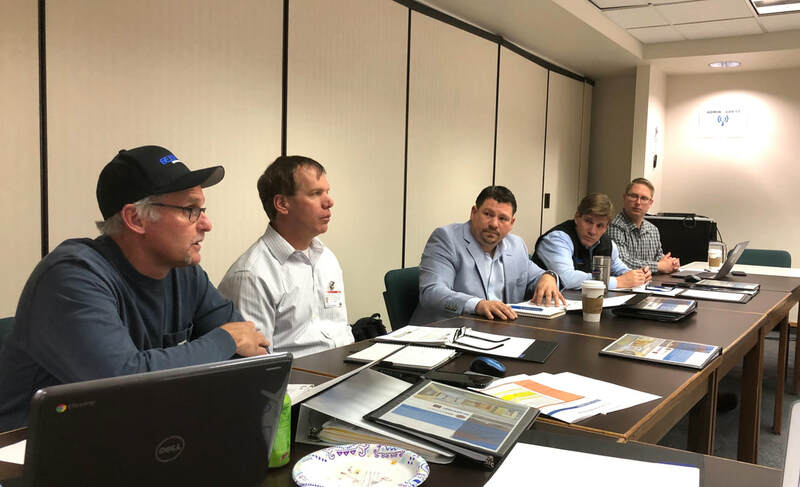 Like the CCMS project, this information allowed us to engage contractors for mechanical, electrical, concrete, and steel, fully kick-starting the Washington construction process. Both of these projects still have long lists of add-alternates that we hope to accomplish when we become more comfortable releasing the rest of the construction team and owner reserves. GE Johnson plans to begin groundwork at the middle school in mid-April, so we'll hold a formal groundbreaking ceremony before then. Holes won't be punched in the ground at Washington until after school lets out, so we expect to hold a groundbreaking ceremony there in early May. Board Vice-President Lloyd Harwood testifies in front of the House Education Committee. On Monday morning I attended a McKinley Turnaround support meeting. 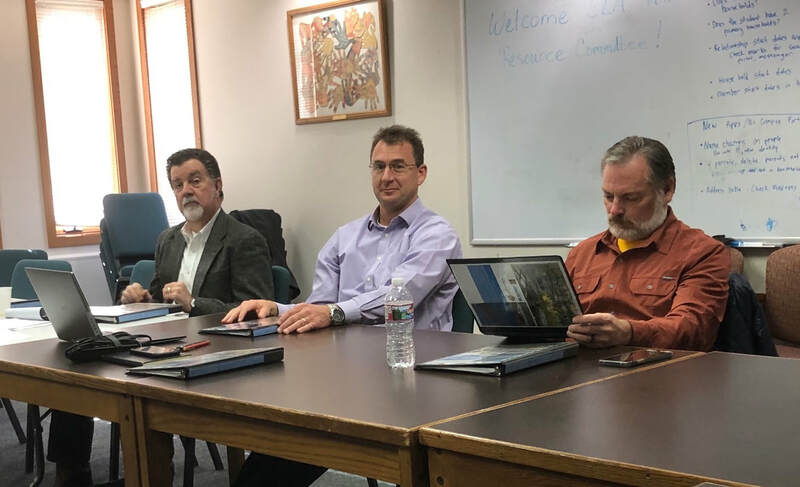 On Tuesday we held a Superintendent Advisory Council meeting and I attended a Colorado Safe School Resource Center advisory board meeting in Denver. I began my day Wednesday with a monthly Central Office Staff meeting, followed by a Cañon City Middle School and Washington Elementary Design Drawings approval meeting. I ended the day in our final Calendar Committee meeting. On Thursday I attended an early morning HomeBiEd Board meeting and a Pikes Peak Alliance legislative advocacy phone conference. I then made my way back to Denver to support Board Vice-President Lloyd Harwood’s testimony on a bill seeking to secure Building Excellent Schools Today program funding. I remained in Denver to present at the Colorado Association of School Executives winter leadership gathering about how state trust land dollars are invested in the BEST program. 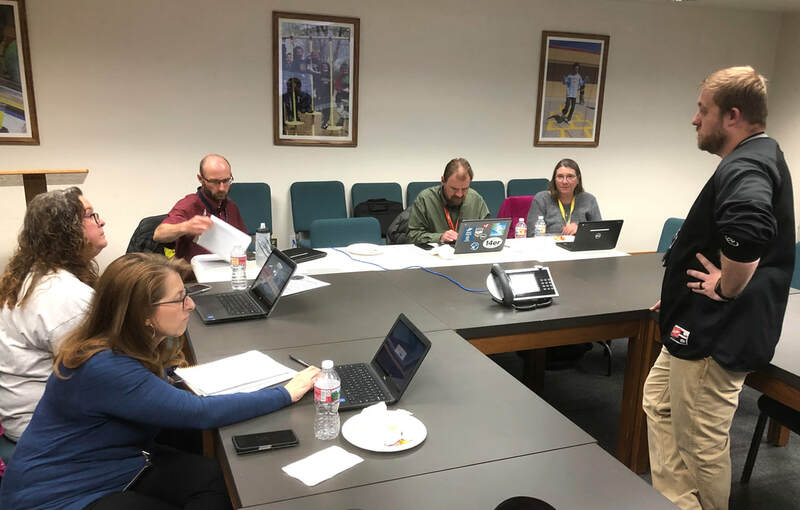 I returned to Cañon on Friday in time to attend a brainstorming session about the future role our technology teaching staff as we continue to implement our one-to-one Chromebook program. Last Tuesday I attended the quarterly Colorado Safe School Resource Center advisory board meeting in Thornton. I'll begin my week reviewing the Nutrition Services Department budget with other district leaders. Surrounded by several meetings about students, I'll then work with Director of Student Support Services Paula Buser to develop a Social Emotional Learning action plan. In the afternoon I'll attend a secondary summer school planning meeting, a board work session, and a board meeting. On Tuesday I'll attend a monthly law enforcement touching base meeting, a Rural Alliance legislative advocacy phone conference, a weekly Superintendent Advisory Council meeting, a Wellness Grant planning meeting, a District Leadership Team meeting, and then I'll attend a monthly touching base with certified association leaders to discuss master agreement items we'll need discuss in conjunction with our hybrid calendar proposal. We have a delayed start professional development day on Wednesday. However, I'll start my work in a monthly touching base meeting with classified association leaders to discuss how a new calendar will impact members. I will then attend an Opportunity Coalition legislative advocacy call and spend the rest of the afternoon preparing for our first Civic Canopy community engagement session. On Thursday I have a Department of Human Services touching base meeting, Harrison leadership touching base meeting, a Pikes Peak Alliance legislative advocacy conference call, and I'll work on department director annual evaluations. I'll continue working on these on Friday and I also hope to make it over to McKinley Elementary for their monthly Wildcat Grill event.